The International Campaign to Abolish Nuclear Weapons (ICAN) is a global coalition which brings together humanitarian, environmental, human rights, peace and development organizations in nearly 100 countries. In the UK, ICAN is made up of a coalition of individuals and partner organisations which include CND, Scientists for Global Responsibility and Medact. Key partners internationally and in the UK also include a range of faith organisations such as PAX Christi, British Quakers, Soka Gakkai International UK (Buddhist), Christian CND and the Joint Public Issues Team (Methodists, Baptists, United Reformed and Church of Scotland). We also work with Religions for Peace to reach out to other religions. “Our faith traditions share a belief in the dignity and unique value of every human life. Consequently, common to our traditions is the invocation that we shall not kill. Our faiths discern a strong prohibition to mass slaughter and the indiscriminate killing of civilians. The threat of mass destruction can never become the norm among nation states and it therefore follows that our common security must be achieved by means other than the threat of use of nuclear weapons. Moral and ethical arguments are key to the ‘humanitarian approach’ to nuclear weapons, which has enabled significant progress to be made towards a new treaty prohibiting nuclear weapons, the first and historic negotiating conference for which will meet in March 2017 following a majority vote at the United Nations General Assembly. Members of Parliament who attended a meeting at Westminster on the Ethics of Nuclear Weapons last year, organised by Martin Birdseye of Pax Christi and Christian CND, said they welcomed the opportunity to discuss such an important issue in more depth and away from partisan pressures. 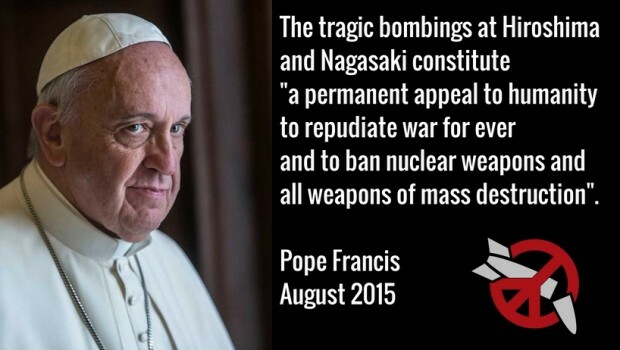 Internationally, Pope Francis has put the full weight of the Catholic Church behind the global movement to ban nuclear weapons. He has urged governments and civil society “to ensure that nuclear weapons are banned once and for all, to the benefit of our common home”. Nuclear deterrence, he argued, “cannot be the basis for an ethics of fraternity and peaceful coexistence”. Pax Christi is doing sterling work trying to persuade the Catholic Church in the UK to follow the pope’s progressive lead on this issue, engaging both grassroots and leaders of the Church. If you are member of a faith organisation, please get in touch to discuss ways in which you could help to raise awareness of the historic ban treaty on nuclear weapons in your community, and urge the leaders of your religion to speak out in favour of it. Faith organisations can use their collective influence to persuade the UK government to join the majority of countries that are pushing for genuine progress towards the prohibition and eventual elimination of nuclear weapons. With landmark negotiations set to open in March 2017, now is a good time to get people excited about the ban treaty.